Today I realised something tragic. The absolute beauty of a clutch that I posted a mere two days ago has gone out of stock. The past couple days have seen me trying to find time to order it but not quite getting round to it, surely this will teach me for the future. Whilst on my usual online ponderings I found this clutch. Completely different to the studded one shown on Sunday, it is black with a navy-ish blue glitter coating, perfect for going with my turquoise dress! 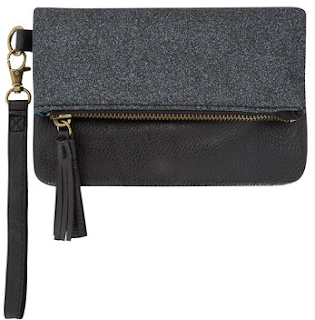 The wristlet style is small and cute, yet spacious enough to fit the essentials. Have I found the one?! £8 from Dorothy Perkins is a bargain also..one that I may just have to take advantage of. Will you help me settle my clutch issues, once and for all?